A Typical Summer Saturday Scene! Grantham Station: A Photographic Survey during the late 1970s. The Buildings on Station Road, east side – late 1970s. The Buildings on Station Road, west side – late 1970s. The Up side buildings, facing platform 1 – late 1970s. The Down side buildings, facing platform 2 – late 1970s. The Down side buildings, facing platform 4 – late 1970s. Some views from the footbridge and rooftops – late 1970s. Grantham Station: The Rebuilding Period in the mid 1980s. Grantham Station buildings – external links. I was NOT ‘The Stig’! Railcars (Diesel Multiple Units) in Grantham and Lincolnshire. Above: Grantham South box is prominent in this view on Saturday 20th July 1963. Passing on the Down Main line is Deltic No. D9004, as yet unnamed, with the 14:00 from London King's Cross to Edinburgh Waverley 'The Heart of Midlothian'. The tall signal controls traffic approaching the box in the opposite direction, on the Up Main line, which can either continue on the Main line or cross over to the Up Goods line as far as Great Ponton or Highdyke. Its two semaphore arms were operated from the South Box - the arm on the left (Up Main to Up Goods) by lever number 14 and the arm on the right (Up Main) by lever number 20. The main signal post, the bracket and the two 'doll' posts are all made of reinforced concrete, making for a heavy structure which is stayed by cables carried over the running lines. There's also a steel tiebar to an adjacent signal post, for the Up Goods line, which is just out of shot on the left. Grantham South signal box was situated 500 yards off the south end of the station platforms, on the west side of the main lines. It was a short distance south of the bridge which takes Springfield Road (known as Brick Kiln Lane until around 1900) under the railway. This was an area of the railway that was fairly inaccessible except by those who had business to be there, so the South box features in far fewer photographs than the Yard and North boxes at Grantham which were closer to the passenger station. Grantham South was the second largest of the Grantham boxes, equipped with 86 levers after its final extension during World War 2 until it closed in 1972. The box was staffed round-the-clock in three shifts (two shifts on a Sunday) by a Signalman of one of the more senior grades and a Telegraph Lad, a trainee signalman. The signalmen at Grantham South controlled all traffic to and from the Peterborough direction on both the Main lines and the Goods lines, and also access to and from the Up and Down side goods yards and the south end of the carriage sidings. Grantham South box was surrounded by railway tracks. The main running lines were in front of the box, while behind it ran sidings. Here are some photographs which help to place Grantham South in the context of the track layout and traffic flows at the south end of the station. Grantham South signal box is at the centre in this photograph, which was taken on Wednesday 19th April 1950. Near the top left of the picture Springfield Road passes under the railway through a low bridge - one that remains a hazard for road traffic to this day. Near top right another bridge carries an internal siding serving the extensive Ruston & Hornsby engineering works. At bottom right one of Grantham shed's class J52 shunting locomotive is at work in the Up sidings. Photograph from Britain From Above © English Heritage. Grantham South signal box in the 1950s or early 1960s. This photograph was taken from a train passing on the Up Main line. In the left foreground is the relay room added in 1932 so that colour light signals at Saltersford could be controlled from the South Box. In the right foreground the outer rail of the Down Main line is visible, cutting across the corner. The line leading directly away from the camera into the background is a connection from the Down Main to, first, the Down Slow line which led to the Western platform. Beyond that, it becomes the Down Goods line which ran to the west of the passenger station, on the far side of carriage sidings (which terminate at the buffer stop at far right). Unlike the North box the locking room windows in the base structure were not bricked up as a wartime precaution, despite the fact that the Luftwaffe took a keen interest in a vital munitions factory on the far side of the allotments at the rear. Grantham South box is off shot to the left, its shadow falling on the scissors crossover, as class A3 No. 60055 Woolwinder passes on an Up express in the early 1960s. This panoramic view of the southern approach to Grantham station on Tuesday 25th July 1961 illustrates how the South Box commanded this area of railway. Prominent just beyond the box are the semaphore signals for the Up Main and Up Goods lines, each with two arms, allowing southbound trains to proceed on the same line or to cross from one line to the other. The Up Main signal has been cleared for a train which will soon pass the northbound express that we can see approaching the box from the right. You can see that the railway was relatively unapproachable here, except by those who worked on it. The western boundary was at the bottom of an embankment (formed of spoil excavated from the Spittlegate Cutting), while industrial premises prevented access from the eastern side. Photograph by Noel Ingram, used with permission from Steam World. This view from London Road bridge is a frame from a cine film shot in the early 1930s by Walter Lee. Grantham South signal box is on the left side of the lines, and the distinctive saw-toothed roofline of part of the Ruston & Hornsby works is on the right. The very tall three-posted Great Northern Railway signal enabled the South Box signalman to direct northbound trains straight on along the Main Line, which took them through platform 3, or onto the Slow line through the Western platform, or via the Goods line which bypassed the platforms altogether. Its height enabled its 'somersault' semaphore arms to be sighted over the bridge by the drivers of trains approaching at speed down the bank from Stoke. Not long after this picture was taken a colour light signal took its place. Used with permission from the Lincolnshire Film Archive. The view north towards the station from beneath London Road bridge on Saturday 20th July 1963. The Up 'Flying Scotsman' train is approaching at speed, headed by English Electric Deltic No. D9006. The South Box signalman is just replacing his Up Main line Home signal to danger - you can see that it's not quite resumed a horizontal position. On the left is the colour light signal for the Down Main line which in the 1930s replaced the tall semaphore signals seen in the previous photograph. A much more compact arrangement which also saved the lampmen a very exposed job, especially in the winter. On the right a loading gauge stands over the siding exit from the Aveling Barford factory so that a check can be made on the safety of consignments loaded onto open wagons before they reach the main line railway. The distant view of Grantham South box, as seen from the station platform in August 1961. The signal post on the right, with four vertically arranged miniature semaphore arms, controls the exit from the Down Goods Yard to the (from top to bottom) Up Shunt, Up Goods, Up Main or Down Shunt lines. The Tees-Tyne Pullman passes at speed on the Down Main line. Viewed in June 1962 from the station platform, Grantham South box is on the right. The circular disc signals in the vicinity of the box control various shunting moves in the Up direction, while the semaphore arms visible above the passing northbound express on the left relate to the Up Goods and Up Main lines. The railcar is occupying the Down Slow line; to its right is No. 1 carriage siding. 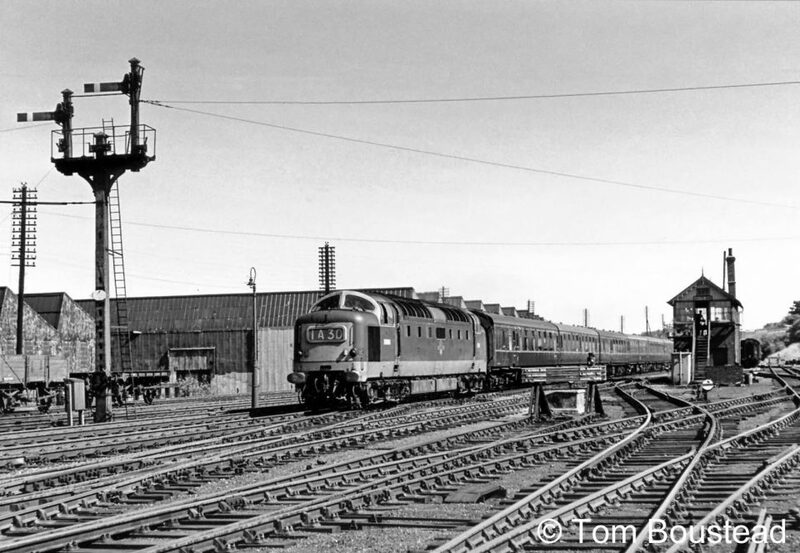 The following photographs were taken by Mick Grummitt, Rest Day Relief Telegraph Lad from 1959 to 1962 at Grantham North and Grantham South boxes, and also at Crescent Junction, Spital Junction and Westwood Junction boxes at Peterborough. A northbound express with class A4 No. 60030 'Golden Fleece'. Part of the complex construction of a double slip crossing is visible at bottom right. English Electric Type 4 No. D201 on a northbound Pullman. Class A3 No. 60066 Merry Hampton is hauling an express passenger train which is scheduled to stop at Grantham. It was running late, so Control asked for the train to be routed to the Western Platform so as to let non-stop expresses past to save further delay to them. It’s being diverted from the Down Main line onto the Down Slow line and the Western Platform using the 'scissors' crossover immediately in front of Grantham South box. The driver has stopped on the crossover, saying he did not know the road and required a local driver as pilot to go into the platform with him. This managed to delay trains behind him by about another 15 minutes. Class A3 No. 60039 'Sandwich' hauls a southbound express on the Up Main line. Class A3 No. 60049 'Galtee More' is leaving the Down goods yard to the Up Slow with the all stations pick-up goods to New England. I guess the crew would be very pleased to have it on such a turn, shunting all stations on the way. Would think she will soon be going to Doncaster for a general overhaul, looking at its appearance. Class A1 No. 60141 'Abbotsford' of Copley Hill shed in Leeds on a southbound Pullman express train, probably 'The Queen of Scots'. A V2 locomotive with an express heading south on the Up Main line. On the right an N2 locomotive shunts the Up side yard. Several of these locomotives arrived from the London area after their work on suburban passenger services north from King's Cross was taken over by diesels. A fish train passes on the Up Main line hauled by class B1 No. 61179 of King's Cross shed. A southbound class H freight passes the South box on the Up Main line, in charge of BR class 9F No. 92070. The prototype Engish Electric Deltic in its spectacular blue, cream and silver colour scheme fills the frame as it speeds past on the Up Main line. A brand new Birmingham RC&W Sulzer Type 2 on the Up Main line. Hull-based class K3 'Ragtimer' No. 61814 on the siding behind the South box. Newly overhauled at Doncaster Works, it has arrived with a goods train from Doncaster to the Down yard at Grantham, has just come off the train and is now away to the Loco. On the left is a yard used by the civil engineer to store track components, with a siding for wagons used on permanent way maintenance trains. A picture taken from the north end of the South Box by the British Railways official photographer to record a special train departing with an export order. On Wednesday 23rd April 1958 recently overhauled New England class B1 No. 61113 leaves the Down goods yard hauling a train loaded with Aveling Barford grading machines bound for Argentina. The wagons would have been supplied empty to the Aveling Barford factory, which was accessed by the same siding as Ruston & Hornsby's. They were loaded inside the factory and brought out to the siding a few wagons at a time by the works shunter. Under the control of the Grantham South signalman they were taken across the Main lines to the Down yard by the Up side pilot and assembled there ready to go. The locomotive is just about to join the Up Main line while its tender is crossing the Down Main. The third and fourth wagons are over the Down Slow, and the middle of the train straddles the Down Goods line (which is equipped with trap points nearer the box). Overlaid on the aerial photograph below are the principal routes set by the South Box signalmen for traffic in the Up (southbound) direction. Scroll from top to bottom to follow the direction of travel. Overlaid on the aerial photograph below are the principal routes set by the South Box signalmen for traffic in the Up (southbound) direction. Scroll from botom to top to follow the direction of travel. Overlaid on the aerial photograph below are examples of routes set by the South Box signalmen for traffic transferring to and from yards and sidings. In 1932 colour light signals were installed on the section of line between Grantham South and Great Ponton signal boxes, replacing the signal box at Saltersford. There was a siding at Saltersford for the nearby Grantham Waterworks and, between 1943 and 1968, there was also a Down Slow loop at Saltersford, controlled from Grantham South box. This is the northbound 'Queen of Scots' Pullman train approaching London Road bridge from the south in 1961. The locomotive is class A1 No. 60120 'Kittiwake' of Copley Hill shed in Leeds. The colour light signal seen in the distance was controlled from the South box. Photograph by L. Perrin, lent by Roger Parker. This is Spittlegate cutting south of Grantham where class A3 No. 60044 Melton is passing with a northbound express in 1960 or 1961. The two signals are the Grantham South box starting signals for the Up Goods line (which is at danger) and the Up Main line (at clear). At Little Ponton class A3 No. 60105 Victor Wild passes with a Down express. The colour light signal suspended from the bracket relates to the Up Main line, the second track from the left; This was the southernmost signal on the Up lines to be operated from Grantham South box. On the right, just visibl;e above the first coach, is a junction repeater signal relating to the Down Main line and its connection to the Down Loop at Saltersford, towards which the train is travelling. The same bridge at Little Ponton, seen from the opposite direction, with the southbound 'Sheffield Pullman' on Monday 6th July 1964 hauled by English Electric Type 4 No. DP2. On the left is a clearer view of the repeater signal relating to the Down Main line and its connection to the Down Loop at Saltersford, beyond the curve in the distance. Copyright note: the article above is published with the appropriate permissions. For information about copyright of the content of Tracks through Grantham please read our Copyright page. 'Tracks through Grantham' authors and contributors retain copyright in all content.